This smallmouth bass fell for a tailspinner at Dale Hollow Lake. Tailspinners are one of the most effective winter lures for black bass in reservoirs. They also fool walleye and sauger below locks and dams during the cold months. Some lures on the market have stood the test of time, catching fish decade after decade. The Dardevle spoon, the Panther Martin and Rooster Tail in-line spinners, the Jitterbug and the Hula Popper still catch fish today like they did when swing music topped the charts. The tailspinner is another old-time lure that still catches fish consistently, and one of the best winter lures for black bass. 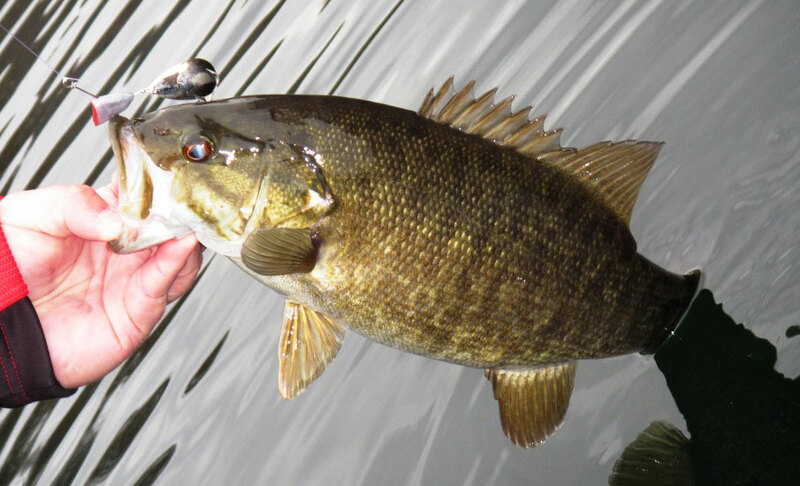 “The tailspinner is one of the only lures to catch a documented 10-pound smallmouth bass and a documented 10-pound largemouth bass,” said Chad Miles, administrative director for the Kentucky Fish and Wildlife Foundation. They are not just bass lures, however. They also catch sauger and walleye below locks and dams during the winter months. Trout also hit tailspinners as do white bass during their spring spawning runs. The lure is a simple design; a piece of lead impregnated with wire and a small Indiana or hammered Colorado spinner blade attached behind it with a treble hook underneath. A Bowling Green businessman named Cecil Pedigo began tinkering with a tailspinner design in the 1960s. He employed a triangular-shaped piece of lead with a concave face to help the lure sink slower, along with a hooked dressed in marabou behind a small Indiana spinner blade. He called it the Spinrite, still held in legendary regard among smallmouth anglers in Kentucky and Tennessee. The Uncle Josh Company purchased the Spinrite from Pedigo and discontinued the lure many years ago, but a Kentucky company is bringing the lure back, appearing in tackle stores in the state soon. Tailspinners are also found in tackle stores around major reservoirs in Kentucky and from most outdoor retailers. The late Billy Westmoreland, considered by many the greatest reservoir smallmouth angler of all time, caught a 10-pound, 1-ounce monster smallmouth on a Spinrite in late winter while slicing points with one on Dale Hollow Lake. He also hooked a smallmouth on Christmas Day of 1970 that he believed weighed between 12 and 14 pounds, larger than the world record. The Spinrite popped out of the fish’s mouth during a long fight. The memory haunted him for many years. Slicing points with a tailspinner is a highly effective and easy presentation for black bass in winter. Fire a tailspinner to a main lake or secondary point and let it flutter down to bass suspended near the point. Reel just enough to keep the line taut and watch intently. Set the hook if you see your line jump, go slack or you no longer feel the blade of the tailspinner thumping in your hand. This presentation is deadly on difficult-to-fish steep points that grow in importance to bass when water temperatures drop to 50 degrees and below. Fish the front and both sides of the point. A ½-ounce tailspinner is the most popular, but a ¾-ounce works well in windy conditions or on deep lakes. These weights work best for smallmouth and spotted bass on our clear, mountainous lakes such as Lake Cumberland or Laurel River Lake. A ¼-ounce tailspinner works fantastic for sleepy, lethargic winter largemouth bass in shallower reservoirs such as Barren River Lake, Green River Lake, Yatesville Lake, Kentucky Lake and Lake Barkley. Largemouth bass are the toughest of the black bass to catch during winter. The late Ted Crowell, former assistant director of fisheries for the Kentucky Department of Fish and Wildlife Resources, used to catch largemouth bass from Lake Barkley in winter on a Spinrite. He said many of the fish were so fat they weighed 5 pounds, but were only 18 or 19 inches long. The compact design of a tailspinner makes it easy to throw one a country mile. Increased casting distance lends more stealth for the low, clear winter conditions on reservoirs. Extra casting distance also comes in handy for walleye or sauger below locks and dams in winter as well as during the spring white bass runs. Sauger strike tailspinners fished just off the bottom below locks and dams on the Ohio and Kentucky rivers during the coldest days of the year. Walleye in the tailwaters below Lake Cumberland, Green River, Carr Creek and Nolin River lakes strike tailspinners as well. Smart anglers fishing below dams replace the treble hooks with a sharp single hook to reduce lures lost on the snag-prone bottom common in these areas. This is a good idea for those throwing tailspinners for trout in tailwaters as well. White bass running in the headwaters of Nolin River, Taylorsville or Herrington lakes strike tailspinners with abandon, often soon after the lure splashes down. Tie on a tailspinner this winter and let this old war horse work its magic.